When Was the Last Time You Had a Cape Town Cruise? For many people, the answer would unfortunately be never. However, did you know Cape Town boat cruises are now more accessible than ever? It is no longer only available to foreign tourists or the affluent with money to burn. Everyday families and friends are booking Cape Town cruises as a way to enjoy our world-class city’s beauty, and to make fun memories that’ll last a lifetime. You too can now enjoy the splendour of Table Mountain and the 12 Apostles from the view of the Victoria & Alfred Waterfront. Book a lunch aboard a floating restaurant, or a romantic dinner for two. Get married aboard a modern catamaran, or book your team’s next teambuilding on a cruise through Cape Town’s most famous harbour. These are only a few of the many ways in which a cruise is the perfect way to let off some steam, unwind and enjoy the beauty that surrounds us every day. Do you want to learn more about our different types of cruise packages? Read on. Our lunch and dinner cruises are very popular, for obvious reasons. Who wouldn’t want to dine aboard a modern and beautifully streamlined catamaran in the V&A Waterfront harbour? If you are in search of a unique venue to host your next event, join us for lunch or dinner. Your guests will be treated to an experience of a lifetime, as they tuck into a delicious buffet or plated dinner. 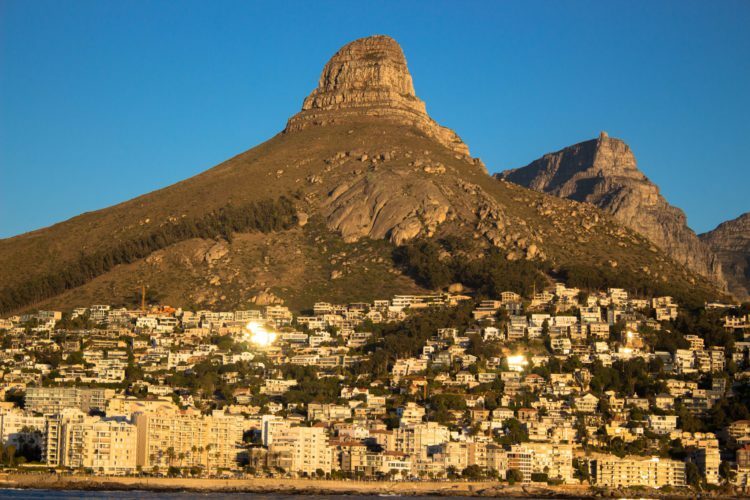 For our dinner cruise, we will first enjoy the Cape Town sunset as we take a scenic bay cruise, and take in the views of Lion’s Head and Table Mountain, as we make our way along the coastline. After this, we return to the mooring to enjoy any of the mouth-watering menus of your choice. It’s bound to be one of the most indulgent experiences of your life. We help you take care of your staff and clients. Throughout the years, we’ve provided the perfect platform for our clients to hold everything from product launches, to sales and training seminars, conferences and everything in between. Let us help you impress your clients, distributors and suppliers with a fun corporate charter in South Africa’s premier harbour. To learn more about our selection of Cape Town cruises, or to arrange for a customised cruise, contact us today. We look forward to hearing from you.